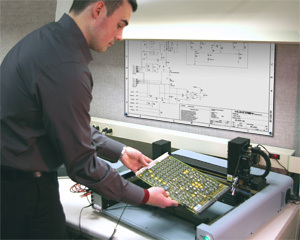 Huntron offers test programming services to develop baseline programs for your printed circuit assemblies. Our Technical Support personnel have many years of troubleshooting experience in real world applications and will provide a good starting baseline test for your PCA. All you will need to do is the final adjustments to customize the procedure, thus significantly reducing your test development times. We generally request three known good circuit boards for test development and several known bad boards for test verification. Circuit board documentation is not absolutely necessary but can very useful in developing effective test routines. If available, ASCII CAD layout data can greatly assist in the test development process saving time and cost. Download the Test Development Information Guide to get a idea for the actual time involved in creating and using a Huntron test routine whether it is developed by you or Huntron Technical Support. Contact Huntron Technical Support for more details regarding Test Development services. The goal of Huntron Test Development is to provide a PCB modeling service to the end user that will save them time and resources. Please note that Huntron has limited knowledge of your PCB and while we will strive to create the best test possible, it should be considered a baseline test that the end user will improve based on their experience and knowledge. Huntron will provide component data entry, teach the Prober XY locations for all accessible components entered, perform scans, set References (known good signatures used for comparison) and debug as needed to ensure best performance. If possible, Huntron recommends that three known good PCBs be provided that will be added to the test as Good Signature Comparison References. Unless otherwise specified by the end user, Huntron will use our standard preferred Tracker ranges for all components but may vary from this practice based on component type. The ranges used will be listed in the Test Development Information Sheet. Huntron will observe proper electrostatic discharge protections while handling your circuit board. Huntron will not perform any solder procedures or conformal coating removal and will not modify the PCB in any way. If a board holder is required to properly support the PCB within the Access Prober, the end user will be notified of the cost prior to construction.